Pedaling Newfoundland’s Viking Trail offers the challenge of “holding your line” along the edge of Trans Canada Highway 430 while being totally distracted by the Gulf of St. Lawrence’s glorious views. Numerous abandoned fishing villages dot the road throughout Gros Morne National Park. The pebbled beaches separating these villages are outlined by steep, vertical, eroded rock columns called sea stacks. This remote wilderness is also the summer migratory route for 22 species of whales, including the world’s largest population of humpbacks plus minke, sperm, blue and orca. Flocks of seabirds numbering in the thousands include gannets, orange-beaked puffins and storm petrels. Birds of prey – eagles, hawks, ospreys – float the currents of the wind. Arctic icebergs, typically calved in Greenland, drift along the shore. The boreal forest, edged by fields of wild flowers dominated by the bright fuchsia-red fireweed, is the nesting site of 350 varieties of colorful songbirds. For sure, when you want a break from sitting on the bike saddle, there is plenty to see, an entire horizon to scan. Our six-day Freewheeling Adventures (freewheeling.ca) bicycle tour would cover about 300 miles between Newfoundland’s airport gateway city of Deer Lake and World Heritage Site L’Anse aux Meadows, where Lief Eriksson and his Norse Vikings landed five centuries before Columbus “discovered” America. Newfoundland and Labrador, Canada’s most easterly provinces and encompassing the northeastern-most point of North America, are surrounded by 18,000 miles of coastline. Triangular in shape, Newfoundland is an Atlantic Ocean island while Labrador, considered part of mainland Canada, shares its western border with the province of Quebec. Visitors to Newfoundland typically fly into the cities of St. John’s or Deer Lake, rent a car or RV (accommodations are scarce), and speed through the province. 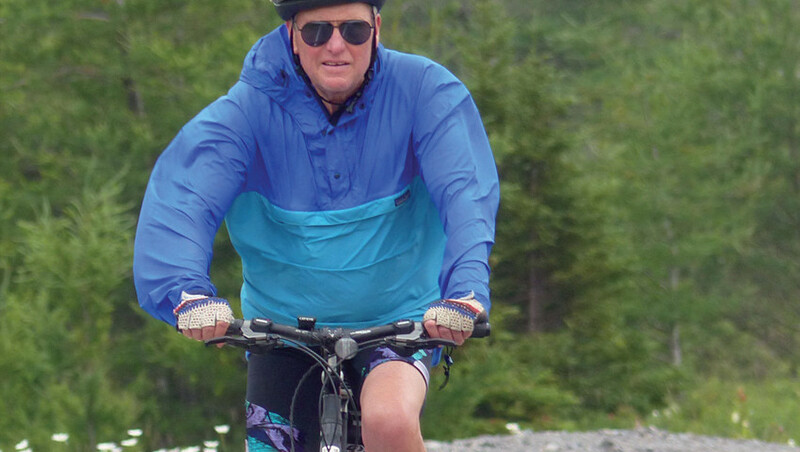 A bicycle tour offers a better opportunity to enjoy scenic vistas while becoming immersed in beautiful surroundings and enjoying Newfoundland culture. Arriving the prior night, we stayed at Lake View Bed and Breakfast near Deer Lake’s airport. The Freewheeling van shuttle detoured to allow us to explore the nearby Newfoundland Insectarium’s collection of butterflies, tarantulas, beetles and bees prior to our hitting the road to begin cycling in Norris Point, the entrance to Gros Morne, a UNESCO site and the second largest national park in Atlantic Canada. Considered part of the Long Range Mountains, Gros Morne is located at the northern end of the Appalachians. In Norris Point we spent several nights at Neddie’s Harbour Inn. Formerly a senior home, the inn has been renovated using creatively designed, handcrafted Newfoundland birch. Newfoundland has long, uninhabited distances without many restaurants. But finding a place to enjoy a meal is never an issue when traveling with Freewheeling Adventures. The Canadian company is noted for creative picnics in scenic places. Lunches served on checkered tablecloths include local cheese, charcuterie, fruit and vegetables. Handmade pastry is served for dessert accompanied by their signature hand-ground coffee. Guides Dan and Riley created our first “pop up” picnic along the highway overlooking Bonne Bay. The following day we were given the option of taking a challenging eight-hour Gros Morne Mountain hike to the end of the tree line, followed by a hand-over-hand climb through rock scree to a summit reward offering a glorious view. A second option was a catamaran tour on the M.V. Emm-Cat. Choosing the latter, we motored through Bonne Bay. The sapphire blue fiord, which flows into the Gulf of St. Lawrence, provided views of spinning white-sided dolphins and moose eating maple saplings. Our background view was a close-up of Gros Morne Mountain. David Forsey, our guide at Norris Point’s Bonne Bay Marine Station (bonnebay.ca), emphasized how precisely Captain James Cook charted the adjacent glaciated fiords carved some 15,000 years ago. The aquarium is geographically located at the southern habitation boundary for Arctic creatures. Other displays include elongated eel pouts, snow crab, striped and Atlantic wolffish, and the rare blue lobster. The following day we took a small ferry from the Bonne Bay landing to Woody Point. The small village features a single street lined with several coffee shops, a bar and an art gallery. Cycling to the nearby Discovery Centre, we viewed its exhibits before continuing our ride through desert-like Tablelands to Trout Lake. Located between Gros Morne National Park’s Trout River and Woody Point, the Tablelands’ ultramafic rock or peridotite illustrates a unique landscape, one thought to have originated several hundred million years ago during a glacial plate collision in the Earth’s mantle. Overlooking Trout Pond, Dan and Riley whipped together another picnic lunch. This time they served the local bakery’s homemade pea soup with warm bread. A 2-mile walk to Western Brook Pond (lake) followed a dirt trail with wooden walkways covering bogs and marshes. About 9,000 years ago, Western Brook Pond, home to salmon, brook trout and arctic char, became landlocked. The pond is not considered a fiord because it is enclosed. Following a picnic of pasta salad, fine cheeses and smoked salmon, we rode 30 miles to Portland Creek, a small waterfront village hosting a population of 77 residents. Patches of fenced land, some with scarecrows, along the two-lane Trans Canada Highway provide vegetable gardens for locals. The lanes are wide without shoulders. Drivers and truckers were bicycle friendly and gave us wide berth. The trip was designed so that much of our riding time had the added bonus of a strong tailwind. We enjoyed the 19-year-old Entente Cordiale, which has five rooms plus an attached suite. The next day’s lunch was served next to the highway adjacent to stored lobster traps and a field of lupine. We dined on hot seafood chowder, Montreal beef, pickled herring and fine cheeses. Our departure from Portland Creek to Main Brook’s Tuckamore Lodge was a long 180-mile ride. This exceptionally long distance, dictated by the scarcity of lodging options, is a day when most riders graciously accept a lift in the van. While Ontarian Claire Coire rode the entire route, she was a heralded exception. After a single night at Tuckamore Lodge, known for its hunting and fishing opportunities, we pedaled to the region settled by the Vikings. Archaeologically and historically significant L’Anse aux Meadows includes a museum in addition to remnants of the sturdy turf buildings the Norse used for winter camping. During their North Atlantic voyages, they encountered aboriginals including the Innu, Beothuk and Mi’kmaq. Our final two nights would be the unique and charming accommodations at Quirpon Lighthouse Inn. We were shuttled 40 minutes through Iceberg Alley in an outboard boat. Guests with fragile stomachs can choose a more strenuous alternative to the sometimes rocky boat ride by hiking 3 miles from Grandmother’s Cove, which is a calm 15-minute boat ride across the bay to the far end of the island. Disembarking at Quirpon’s primitive rubber dock, we hiked for 15 minutes up a wet, gravel road to the inn, which is adjacent to the 1922 still-in-use lighthouse. Howling wind, pouring rain and choppy waves limited our ability to view the numerous whales and seasonal icebergs typically sighted in the glass-fronted viewing building. Following our stay at Quirpon we were shuttled either to the airport in St. Anthony or Deer Lake to catch our return flights. Traveling with Freewheeling is all about adventure. We cycled our own limits, hiked and enjoyed scenic boat rides. Newfoundland offers a beautiful landscape with friendly residents. Its remoteness and distance makes it a unique Canadian province. A clear evaluation of physical limitations is required for this trip. Keep in mind there are numerous options. Those who don’t cycle can ride in the shuttle van. Advance training is very useful. The ability to ride 20 miles between 10-15 mph or two-three weekly gym spin classes should be adequate. Riders can determine the distance they want to ride by letting the shuttle driver know in advance or signal when the van passes them along the road. Freewheeling offers electric-assist E-bikes, which are handy for long distances and hilly terrain.